The Buttercup originates from Sicily and was first imported to the United States in 1835. The name comes from the unusual cup shaped comb and glorious golden feathering. They are rare birds and the males and females have very different plumages. Males sport rich deep orange feathers with a greenish black tail while the females are a wonderful gold with black spangles running in parallel rows producing an almost spotty appearance. They are small attractive birds. The earlobes tend to be white and the legs are a soft green. The Buttercup is not a prolific egg layer, only producing a small number of small, white eggs per year. They are not known for being broody. They are flighty, active birds and do not like being kept in confined runs, preferring to be out free ranging where possible. They are prone to frostbite on their elaborate combs so care needs to be taken when the temperatures drop below freezing. They don't really like human contact and tend to keep their distance. Chicks are early maturing but the cup shaped comb takes a while to develop fully. i have two buttercup hens, and they get along great with other chickens! I have two of these sweet little hens. 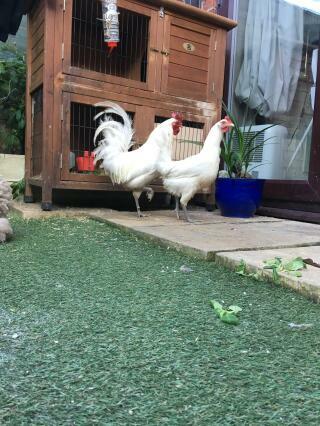 They are friendly, and good natured with my other hens. They do not lay every day, so I did not give them high marks in that regard. They lay about every other day, or every third day. The eggs are smallish, and white. These chickens tend towards flight, so you'll have to clip wings or have high fences or an enclosed run. Even though they are not dynamic producers, they are such beautiful little hens that I don't mind having them around.